Only giving this five stars because I'm married to the author's husband. should’ve been. It’s a nice long read about a close-knit group of gay friends and their straight allies that jumps back and forth between the height of the AIDS crisis in Chicago and present day Paris. Makkai does a pretty clever thing here by drawing parallels between the Lost Generation from WWI and survivors of the AIDS crisis. Ordinarily, when I read books that go back and forth between two narrators I tend to have a favorite, but in this case I didn’t. Both Fiona and Yale’s parts address the central question of what happens to our communities when they are ravaged? Who carries on the memories? What does it mean to take on the burden of that mantle? And how do families—biological and chosen—reconcile with lives that can be simultaneously too short and too long? To say that I loved this book would be both an understatement and a misrepresentation. I can’t say that it was the best book that I’ve ever read or the one that moved me the most. Some parts—like Yale’s almost aggressive naïveté or Claire’s tenuously grounded animosity towards her mom—troubled me from a craft perspective, but I somehow love it all the more for its flaws. It’s almost like that friend who you know is kind of a boar but you enjoy spending time with anyway. I loved the flaws here. I was in the world fully. 1980s Chicago, the devastating AIDS epidemic seen through the eyes of a group of gay friends as they slowly lose so many in their circle of friends, reflects the time in a realistic way . Fiona who has lost her loving brother and many of their friends over the years travels in to Paris in 2015, connecting with Richard an old friend from those times, as she searches for her daughter and the grandchild she has not met. The chapters alternate between these two time periods and these two places and it was good to have the connection of some of the same people so moving from one time to another felt seamless in ways. This is an important story depicting the devastation of the Aids epidemic, but there were so many times when I felt that the story dragged on, was too long, that I was not as captivated as I hoped I would be. While I was definitely moved by the 1980s sections in the first half of the book, there were too many characters and I found it difficult to connect. However, the last quarter of the book really changed my overall feelings about the story. It was in these last chapters when we see the intimate thoughts and profound affect on one of the characters, Yale, that I became much more connected emotionally. The awfulness of the physical symptoms and the emotional toll were heartbreaking and Yale is a character that I felt I came to know in a much deeper way than others . In the 2015 ending chapters, Richard’s photographic show brought the two time frames together full circle in a perfect way. Again I think it’s an important story to tell and an important one to be read. For that and the last part of the book I’ll round up to 4 stars. I read this with with Diane and Esil. Diane loved it most , I think, and had a special connection since she is from Chicago. I received an advanced copy of this book from Viking through Edelweiss. 4.5 The story opens with the death of a young gay man, named Nico. Disowned by this family for his sexual preference, that is all but his younger sister, Fiona, who is with him until the end. This is her introduction into the gay community, a community that will embrace her as she embraces them. It is the eighties in Chicago, Boys town and the AIDS epidemic is in full swing. We meet many of these young men, so many whose families have cut them loose. See their fear, their sorrow as more die, or find out they have the virus. Fiona, is with many of them, caring for them when they cannot care for themselves. I can't imagine watching everyone you love die, and we see how this affects Fiona in her life a dual story line with the second in 2015 as Fiona searches for her own grown daughter. She finds Richard, a photographer, a survivor from the eighties, and there will be another to survive, a total surprise.. Reminded me a little of A Little Life, the scope, the friends, losing so much. Maybe because it was set in Chicago, all places I've been, so could imagine this story visually.Belmont Rocks, Lincoln Park and the zoo, Halsted, and Ann Sathers restaurant, one of my favorites in the city. In the Seventies, I hung in Old Town with a group of friends, two were gay, a couple, Jimmy and Max, they were wonderful, don't know what happened to them. I got married, had children, lost touch. I loved this novel, could fully embrace and connect with the story, a story that takes the reader fully into this time period. The political ramifications of a government that was totally unconcerned, a public that turned their heads since this only affected gays, which proved not to be true. The insurance companies, and the way they fought not to pay claims, citing preexisting conditions, so that many died in Cook County hospital. Families, who cut their children off, many never speaking to them again. We see the other side too, friends banding together, trying to be there for those who had nobody. A mother who stays with her son through this terrible time. So many of these characters we come to know intimately, especially Yale, who is our narrator along with Fiona. Their is a secondary plot in the eighties that concerns Fiona's aunt and some valuable artwork. It was a little drawn out but it does tie into the story and is something Yale is determined to complete. Yale's sees it as a honor to a love that never stopped. Northwestern and DePaul, places Yale works, DePaul a school my youngest daughter graduated from, know it well. In the present Richard and his photographic exhibit will bring the novel full circle, giving the many who had died, once again a voice. Merging the past with the present. This was Angela, Esil and my read for March. I liked this one more than they, found it both profound, touching and a story that needed to be told. I'm between 3.5 and 4 stars, rounding up. 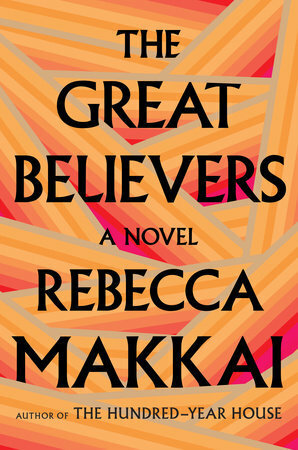 , Rebecca Makkai's beautifully poignant yet meandering new novel, it is 1985, and Yale Tishman and his partner, Charlie, are preparing for the memorial service for Nico, a friend who has recently died of AIDS. The gay community in Chicago where they live has been devastated by this recently discovered disease, as have gay communities across the country. The sense of loss they feel is just beginning to hit them, as they begin hearing more and more about people getting sick, more people living in denial and fear, more people simply disappearing. As much as the disease and people's attitudes towards it affect him, Yale has other things to focus on. As the development director for a university art gallery, he stumbles on an unexpected windfall: an elderly woman wants to bequeath her collection of 1920s artwork to the gallery. But uncertainty about the artwork's authenticity and familial outrage at the potential value of a gift that could be given to strangers causes Yale and his colleagues more stress than anticipated, at a time when emotions are running high in his relationship with Charlie as well. With the disease circling ever closer, Yale finds his life changing in many ways, and he begins relying more and more on Fiona, his friend Nico's younger sister. Fiona is wise beyond her years, and finds herself acting as a companion of sorts, and ultimately, power of attorney, for many of her late brother's friends. It's a role that impacts her greatly. feels like a judgment. We've all got a little Jesse Helms on our shoulder, right? If you got it from sleeping with a thousand guys, then it's a judgment on your promiscuity. If you got it from sleeping with one guy once, that's almost worse, it's like a judgment on all of us, like the act itself is the problem and not the number of times you did it. And if you got it because you thought you couldn't, it's a judgment on your hubris.'" In a parallel storyline which takes place 30 years later, Fiona has traveled to Paris to try and find her estranged daughter, who had fled the U.S. after joining a cult. Fiona's relationship with her daughter has always been difficult, but she hopes to make peace with Claire. She stays with an old friend from Chicago, Richard Campo, a photographer who made his name in the 1980s taking pictures of those in the community affected by AIDS, many of whom were his friends and former lovers. Surrounded by memories both photographic and anecdotal, Fiona is haunted by the ghosts of her friends. She comes to realize how much she sacrificed caring for and loving these men, sacrifices which affected her marriage, her relationship with her daughter, and her life. But given the chance, would she do it over again, or would she put herself and her own life first? ), although this is very different. Makkai did a phenomenal job capturing the emotions, the fears, the culture, and the challenges of those infected with AIDS in the early days of the disease. I enjoyed Fiona's character and her journey, but I could have done without her protracted search for her daughter and her interaction with another random character, although I like the way her modern-day storyline intertwined with Yale's. And while I loved Yale's character and could have read a book about him alone, I'll admit I could have done without the whole art thing, although it did set other plot points into motion. I was fortunate to come of age after AIDS had been discovered so I understood the risks and methods of prevention much better than those who came before me. But that doesn't mean that life in the late 1980s and early 1990s weren't without fear and ignorance and prejudice toward those with the disease. Makkai is a tremendously talented writer, and I've read a few of her previous books. While this book frustrated me at times, I still really found it compelling and emotional, and feel like Makkai did an excellent job examining a bleak time in the LGBT community.